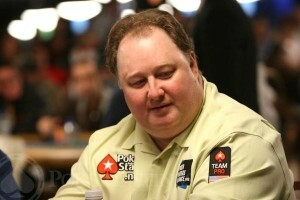 2004 World Series of Poker Main Event champion Greg Raymer has always been considered a solid poker player, as his follow-up performance in the 2005 WSOP Main Event run and numerous cashes since then attest to. That said, in recent years Raymer has been seen more as a spokesman (for PokerStars and pro-online poker lobbying groups like the Poker Players Alliance and FairPlay USA) than a poker player, but Raymer has shed that label in 2012 with his recent winning streak at Heartland Poker Tour Main Events, once again making headlines for his work on the felt not off of it. In July Raymer took down his first HPT title by winning the HPT Albuquerque Main Event. The Fossilman followed this up with a second HPT win in October by capturing the HPT Missouri II No Limit Hold’em Main Event, becoming just the second man in the tour’s history with two HPT titles. Now Raymer is in unchartered territory after winning the HPT Prairie Meadows Main Event in Iowa. Raymer not only picked up his record-setting third HPT title but this is his third HPT title of the year, virtually locking-up the HPT Player of the Year award before the halfway point of the season! It should be noted that Raymer took advantage of the rebuy format, using a total of five bullets during the opening day of the tournament, although that shouldn’t take away from the overall accomplishment. Raymer is on one of those runs that are hard to put into perspective since nothing like this has ever been accomplished before. Back-to-back major tournament wins are possible (see Marvin Rettenmaier) but for a player like Raymer in well-attended tournaments like HPT events this is unchartered waters, and there is still a lot of poker to be played before the HPT closes out their season.